‘Forward to Freedom’ opened last Friday, June 12th, at the Museum of London to mark the fiftieth anniversary of the Anti-Apartheid Movement (AAM). 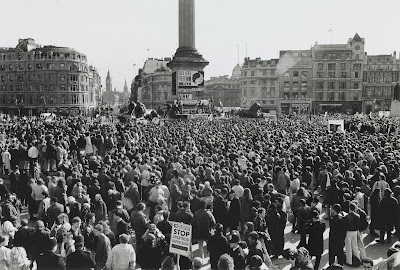 Showcasing posters, stickers, badges, leaflets, photographs and footage of anti-apartheid demonstrations, the display reveals the diversity of the campaigns across Britain against apartheid and minority white rule, which ranged from cultural, to sport, to consumer boycotts. The display is organised in partnership with the Anti-Apartheid Movement Archives Committee and the Bodleian Library, which holds most of the archives. Anti-apartheid campaigners fought for almost fifty years before Nelson Mandela was eventually released from prison, in February 1990. Apartheid was officially abolished, in 1994, when he was elected to power in the first post-apartheid general elections. The policy of apartheid was adopted in South Africa when the National Party, founded by Afrikaner nationalists in 1914, came to power in 1948. At the time, 70% of the population in South Africa was African, 17% was white and 13% was ‘Coloured’ (i.e. of mixed descent) or Indian. The white population owned 87% of the land. The African population owned the remaining 13% of the land. The Coloured and Asian populations had no land rights; they merely had resident rights. In accordance with the policy of ‘divide and rule’, Africans were placed in homelands and their movement outside the homelands was controlled by passes. It is estimated that by the 1980s approximately 3.5 million people had been uprooted from their homes. It was not until June 26th 1959, however, ten years after the institution of apartheid in South Africa, that the Boycott Movement, which later became the AAM, was founded. The movement initially called for a boycott of fruit, cigarettes and other goods imported from South Africa. It soon grew, however. Opposition spread to a wide range of other fields and the AAM moved beyond being a British London-based movement, seeking to influence the policies of international organisations such as the United Nations and the International Olympic Committee. In Britain, local authorities began to issue declarations against apartheid and, by 1985, over 120 local authorities had taken anti-apartheid action. A poll in 1986 also revealed that over a quarter of British people did not buy goods from South Africa. In 1964, the labour government imposed a ban on arms deals with South Africa (there allegedly remained loopholes, however, and the ban was lifted by the Conservative government in 1970). 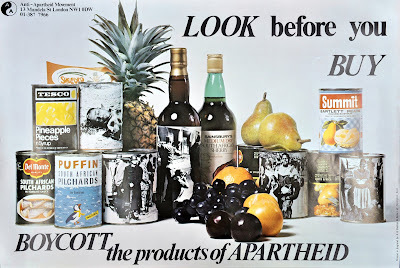 The boycott became a global measure in 1977, when the United Nations Security Council imposed an international ban on arms trade with South Africa. South Africa’s diplomatic relations were also affected. Following pressure from African and Asian countries and Canada, South Africa withdrew from the Commonwealth, in 1961 and, in 1963, the United Nations General Assembly called its members to end trade and diplomatic relations with South Africa. British and international boycotts also extended to the cultural and sporting scenes. The ‘Public Declaration of Playwrights against apartheid’ signed by authors such as Samuel Beckett, Graham Greene, Harold Pinter and Arthur Miller imposed a cultural boycott on South Africa. In sport, South Africa was excluded from the Tokyo Olympic Games, in 1964. The Springbok rugby tour matches in Britain, from October 1969 to February 1970, were disrupted by protests and the Springboks were excluded from the first two rugby world cups in 1987 and 1991. By 1990, South Africa was expelled from every major world sports federation. The ‘Nelson Mandela: Freedom at Seventy’ campaign, in 1988, was one of the last major campaigns led by the Anti-Apartheid Movement in an attempt to secure Nelson Mandela’s release from prison for his seventieth birthday. In 1989, the Harare Declaration was endorsed by the United Nations Security Council, setting the necessary conditions for negotiations to end apartheid. The display is a credit to the resilience of those who supported and fought for the AAM, battling in Britain and exporting their campaigns worldwide to a wide range of different spheres. Nevertheless, it also raises a number of questions. Why did victory not come sooner? Why did the movement not begin earlier, immediately after apartheid became the official policy of the National party government in 1948? What sparked the protest movements at the beginning of the 1960s? On June 26th, ACTSA will host a conference to mark the anniversary of the foundation of the AAM. Speakers, including Abdul Minty, the founder of the AAM, members of the movement during apartheid, Glenys Kinnock MEP and Jon Snow, will discuss the achievements of the AAM, the lessons of its campaigns and how they can be applied to the issues facing southern Africa today. In the afternoon, various workshops will consider some of these issues and produce proposals for action. Her Excellency, Lindiwe Mabuza, South African High Commissioner will host a reception in the evening.